The Great Dane Breed Council would like to remind all visitors to it’s site that much of the material especial that on DCM from the University of Liverpool Small Animal Teaching Hospital is Copyright and should not be copied or otherwise used without written permission of the Great Dane Breed Council. The Secretary can be contacted by email secretary@danecouncil.org.uk. I am delighted to say that the KC have agreed to our request for DNA testing for Inherited Myopathy in Great Danes this is a great move forward and something that is within our control and with careful breeding can be eradicated from our breed, so please support your breed and test, any queries please don’t hesitate to contact me. The following has recently been received from the Kennel Club. The Kennel Club’s Health Team would like to make you aware that following consultation with the Dog Health Group, the Kennel Club has confirmed that from 1st August 2018, any DNA health test result submitted for inclusion on its database must have at least two forms of identification on the result certificate. It will be mandatory to include the dog’s microchip or tattoo number along with either the dog’s registered name or registered number. Any test results that do not carry these identifying features will not be accepted. This brings the recording of DNA test results in line with those health tests carried out by the British Veterinary Association. If you would be able to disseminate this information amongst breeders and owners in your breed it would be greatly appreciated. Should you have any queries regarding the above, please do not hesitate to contact either Hannah James or another member of the Health Team. 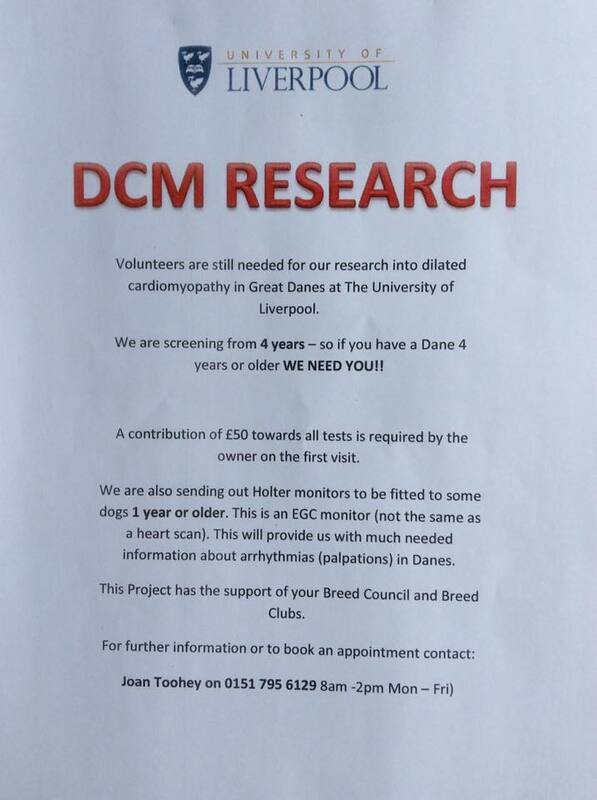 Attached is a flyer from the University of Liverpool Small Animal Teaching Hospital seeking Great Danes for DCM screening. Please contact the hospital through Joan Toohey 0151 795 6129 (08:00 to 14:00 Mon – Fri). Please see the attached letter regarding the cancellation of the 2017 Health Day due to the lack of numbers. KEITH SHEA – Fit and Fertile Ltd. Attached is a message and details from University of Liverpool DCM Project calling for volunteers 4 years or older to be scanned for DCM. If you wish for your Great Dane to take part in this project please be prepared to contribute £50.00 towards the costs and contact Joan Toohey on 0151 795 6129 (Mon – Fri 8am – 2pm) for further information or to book an appointment.